This weeks Blog of The Week comes from the brilliant minds over at Norris Health. They take us through Iliotibial band syndrome and how to manage it. As always, please tweet us and let us know your thoughts or if you have other ways to manage ITB. Ilio Tibial Band Syndrome (ITBS) is a painful condition which can affect the outside of the knee or hip. In runners, when pain occurs on the outside of the knee it is often termed ‘runners knee’ and when at the hip, ‘clicking hip’. Studies have shown the condition to occur in roughly 14% of runners, making it one of the most common painful conditions seen in this group (Van der Worp 2012). This article focuses on the knee, while the hip is the subject of another article (Norris 2012). The ITB is a non-elastic collagen cord stretching from the pelvis to below the knee. At the top it is attached to the iliac crest where it blends with the gluteus maximus and tensor fascia lata. As the tract descends down the lateral side of the thigh, its deep fibres attach to the linea aspera of the femur. 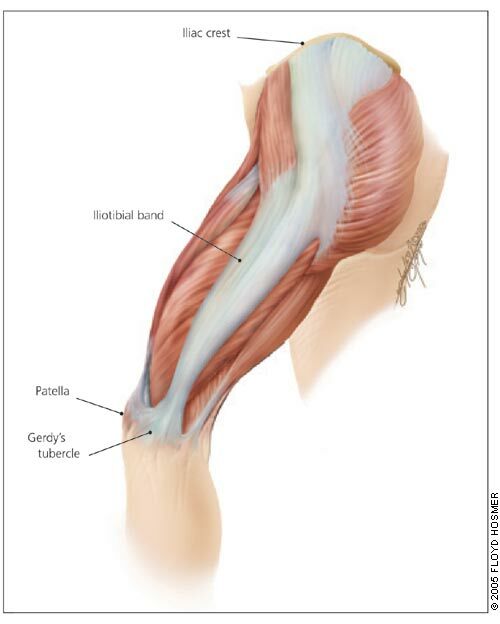 The superficial fibres continue downwards to attach to the lateral femoral condyle through fibrous bands, lateral patellar retinaculum and anterolateral aspect of the tibial condyle (Gerdy’s tubercle) and to the head of the fibula. A large amount of the lateral retinaculum actually arises from the ITB to form the iliopatellar band having a direct effect on patellar tracking (Zachazewski, Magee and Quillen, 1996). In standing, the ITB lies posterior to the hip axis and anterior to the knee axis, and therefore helps to maintain hip and knee extension, reducing the muscle work required to sustain an upright stance. As the knee flexes to 30° the ITB passes posterior to the knee joint axis, and in so doing it appears to glide over the lateral femoral condyle. Anatomical dissection (Fairclough et al 2006) has shown the ITB to be firmly attached to the distal femur by fascial bands which act as tendon entheses. Deep to these bands lies fat which is richly innervated and vascularised. The presence of nerve sensors (Pacinian corpuscles) within this fat may suggest a proprioceptive role for the ITB. 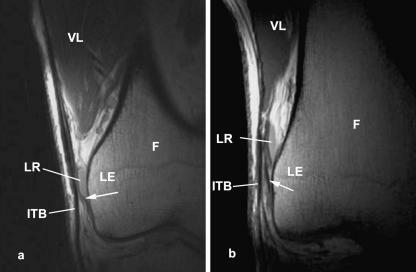 There is no separate bursa beneath the distal ITB (Nemeth & Sanders 1996), but the lateral recess (an invagination of the knee joint capsule) of the knee will often be visible on MRI scan. Two portions of the ITB are visible in a well-defined subject (low % bodyfat). A tendinous part lies proximal to the lateral femoral epicondyle and a ligamentous part passes between the femoral epicondyle and Gerdy’s tubercle on the tibia During knee movement different parts of the distal ITB are placed under tension. In knee flexion the posterior bundles of the ITB tighten, while during extension the anterior portion is tense. This alternating anterior-posterior tissue tension gives the appearance of the ITB sliding forwards and backwards. However true AP movement cannot occur due to the tight fibrous bands binding the ITB to the femur (Fairclough et al 2006). ITBS can occur in a number of subject groups. The tall, lanky teenager who has recently undergone the adolescent growth spurt may experience pain if soft tissue elongation lags behind long bone development, and tightness in adolescent females is a consistent factor in Patella femoral pain syndrome (PFPS). In runners, particularly those who cover longer distances, a number of factors can contribute to the condition. Running on cambered roads and using shoes worn on their lateral edge will increase varus knee angulation and may change loading through the ITB. A Rapid increases in tissue loading with speed or hill work may challenge the tissues ability to adapt quickly enough. Pain can occur over the lateral hip (trochanteric region) or lateral knee (femoral condyle). Pain is experienced to palpation, but also to limited range squats or lunges on the affected leg. As the knee flexes and the ITB passes over the lateral femoral condyle, fat compression rather than friction may occur (Fairclough et al 2007). Flexibility tests, particularly the Ober manoeuvre and Thomas test, often reveal pain and a lack of flexibility. In addition, compressing the ITB over the proximal part of the lateral femoral condyle with the knee flexing and extending to 30° may elicit pain. Where passive adduction (Ober test) is limited, active abduction is often also affected, and so rehabilitation must address pelvic control over the fixed foot as part of a multimodal treatment programme. As with many types of tendinopathy, these is little inflammation in this condition. Enlargement of the distal structures normally reflecting increased blood flow and fluid retention within the underlying fat layer rather than an active process involving swelling. The small amount of inflammation which is present produces chemical irritants to activate the local neural sensors (nociception). To reduce tissue irritation, loading must be reduced initially. Modifications include alterations of running surface and footwear, gait modification, and changes to training intensity, frequency, duration and content. Where limited range motion is identified, stretching procedures may be pain modulating, although any improvement in motion range will be from alteration in muscle tone rather than overall lengthening of the ITB itself. Static stretching into hip extension and / or adduction may be used for subject self-management and will often ease pain and stiffness. These actions should be practiced first thing in the morning where an athlete finds the condition stiff on rising, and after prolonged sitting. As compression is one of the factors in the condition, repeated stretches may increase irritation so the condition should be monitored throughout rehabilitation. Three stretch positions may be useful, the Ober test position, half kneeling, and a modified straight leg raise using a belt. In the Ober test position (side lying on non-painful side), the pelvis is stabilized by the subject flexing and holding the lower knee. The affected upper leg is initially abducted and extended at the hip and flexed at the knee. From this position, hip extension is maintained and the leg is pushed downwards into adduction, and held for 30–60 seconds, with the stretch being repeated four or five times. As adduction commences, the subjects’s pelvis will tend to tilt and an assistant should press down on the rim of the ilium to stabilize the pelvis and increase the stretch. Rather than a passive stretch this involves eccentric action of the hip abductors followed by isometric contraction of the adductors. to avoid dipping towards the affected leg and releasing the stretching force. Lying on the back, the affected leg is lifted straight and a webbing belt (yoga belt) is looped over the forefoot and held in both hands. Initially the belt is used to draw the leg towards the head (hamstring stretch) and then the belt is transferred into the contralateral hand and the straight leg is drawn across the body moving the hip into adduction. Between treatment sessions the subject should attempt these procedures at home. The weight of the leg may be used to press it into adduction, and a weight bag on the knee will assist this. In addition, a training partner or family member can be taught to help maintain lumbopelvic stability. Passive techniques including self-massage, trigger point release and foam roller techniques do little to the structure of the tissues themselves, but may offer pain relief reducing the requirement for medication. In some instances the technique may allow subjects to train without pain, however caution must be used if passive techniques are disguising underlying pain due to tissue weakness. Foam rolling and trigger point release is used to target the muscles (tensor fascial lata and gluteals) attaching into the ITB and the tender areas mid-way down the outer thigh. As ITBS is caused by compression of the fat at the insertion of the ITB, compressing this area further with a foam roller is likely to increase pain. To perform foam rolling, lie on your side (painful side down) with a foam roller beneath your hip or upper leg. Bend your top leg, placing your foot on the floor and use it and your hands to control your movement. Move your body up and down to roll the tissues and reduce pain. Where trigger points are targeted use you hand or a trigger point tool / firm ball to press into the painful spots. Build up the pressure gradually aiming to relieve pain. Your physiotherapist may use deep tissue massage or acupuncture techniques to further target the pain (Norris 2003). Again, the effect won’t be on the fascia itself simply to the pain. It is the rehab that you do to strengthen the muscles around the hip and alter loading on the ITB which ultimately will help with the condition longer term. Weakness in the hip abductors may allow the pelvis to tilt or ‘dip’ during the stance phase of walking or running. This often gives the impression of a mild Trendelenburg gait, and may be habitual following lower limb injury. Gait re-education and abductor strengthening may be helpful, and these may be performed in combination with muscle lengthening (eccentric contraction). The abductors may be strengthened from an open chain or more functional closed chain starting position. Open chain strengthening is performed using a weight bag in a side-lying hip abduction (scissor) exercise with the knee extended, or classic clam shell where the knee is bent. Side lying hip abduction is performed lying on the non-affected side. A weight bag is placed on the affected leg at the knee (less leverage) or ankle (greater leverage). The action should be pure hip abduction with the Greater Trochanter (GT) facing towards the ceiling, rather than flexion-abduction with the GT facing slightly backwards. This movement can also be modified to incorporate ITB stretching for pain modulation. In this case the subject lies on their side at the front edge of a bench or bed. The leg is held in a flexed position at the hip with a weight bag on the ankle. The action is to lift into abduction and then lower into adduction below couch level to impart the stretch. This movement uses an eccentric action to strengthen & lengthen the hip abductor muscles. The Clam shell exercise is an isolation action for the side hip musculature and often the exercise of choice for the Gluteus medius muscle in popular exercise such as Pilates. Interesting however it is the side lying hip abduction (above) which has been shown to produce the greatest contraction of this muscle in EMG (Distefano et al 2009). The subject lies on their side with feet and knees together (placing a folded towel between the feet aids grip). The action is to keep the feet together and lift the top knee. When the abductor muscles weaken the leg cannot be lifted as high, so it is useful to have a training partner lift the knee as high as it will go and the subject attempts to hold this high position (isometric hold) and lower the leg under control (eccentric action). The aim is to eventually be able to lift the knee to its full inner range position. Closed chain strengthening is carried out with the athlete standing on the affected leg, or using a bridging action. The shoulder bridge is used to target the Gluteus Maximus. It is performed lying on the back with the feet hip width apart and hands on the floor. The action is to lift the hips up until the knee, hip, and shoulder forms a straight line. The exercise intensity is increased by placing a weight on the pelvis, or by performing the single leg version. For the single leg bridge the feet are together, the bridging action is performed, and then the unaffected leg is straightened to take full bodyweight on the affected leg alone. The exercise intensity of both versions may also be increased by placing the feet on a lift (step or bench). Gluteus medius activity may be increased in the bridge by placing a resistance band around the knee and pressing the knees apart (against band resistance) throughout the movement. The pelvic drop action targets the Gluteus medius in a functional standing position which mimics the action seen in the Trendelenburg test. In this test, as the bodyweight is taken onto the affected leg and the other leg lifted, the pelvis drops towards the better leg. The drop occurs because the hip abductor muscles are not strong enough (or lack endurance) to hold the pelvis aligned. In this exercise the subject stands on a step on the weaker leg and allows the pelvis to drop. The action is to keep both legs straight and to hitch the hip up to lift the pelvis and make the leg appear shorter. The action is made harder by standing on an uneven surface (balance cushion) as balance is additionally challenged increasing demand on the hip musculature to maintain hip-pelvic stability. The Side lying plank exercise begins in a similar side lying position to the hip scissor action above. This time the subjects affected (weaker) leg in underneath however. The action is to form a side plank (elbow or hand) and then to lift the top leg in a scissor action to place a significantly greater demand on the hip abductor muscles of the lower leg. This action has been shown to work the Gluteus Medius muscle to 103% of maximal voluntary isometric contraction (MVIC) using EMG (Boran et al 2011). The Resistance band side walk (lateral band walk) is performed with a resistance band around the knees, and the knees slightly bent. The action is to side step in one direction, stop and then side step back facing the same way. In each case the leading leg works the muscles hard concentrically initially, while the trailing leg works eccentrically at first. As the direction is changed the muscle work is reversed. The resistance band position may also be used in a squat action to encourage hip abductor action and correct a knock knee position often seen when a novice begins squatting. Squatting actions are useful to target all of the lumbo-pelvic musculature, and are functional actions used in daily living to sit and rise from a chair for example or when lifting (also see deadlift below). Subjects can begin in a ¼ or ¾ squat to limit range and use a high or low bench to touch down onto. Range of motion can increase and full squats have uses for lower limb rehab, although tension in the patellar tendon may be a consideration where weighted squats are used. Full range squats may be performed holding a single dumbbell upright in both hands (Goblet squat). Hip stability is targeted further in single leg squats again to greater or lesser range, and with more or less support to challenge balance. Single leg squats have been shown to work the Gluteus Medius at 82% of MVIC (Boran et al 2011). The squatting action may also be progressed to deadlifts, where the muscle work of the legs is similar to that of the squat, but upper body and trunk work is increased. Changing your running pattern permanently is difficult to do, and could be unwise if it impacts on a subjects performance. The reason is simply that most people run in a way which suits their body, and many Olympic athletes have gait patterns which would seem to be less than optimal – yet they work! However, a suboptimal gait pattern may place excessive stress on a tissue and be a co-factor for tissue irritation. If changing a gait pattern temporarily eases pain and allows recovery while tissue resilience is being enhanced, it can be a useful element of a progressive training programme. Two gait modifications have been shown to be successful in the management of ITBS, step width and cadence. Some subjects with ITBS exhibit a crossover gait pattern when they run. Here, as the foot is lifted from the ground at toe off (leg and foot moving behind you) the foot is flicked into adduction and crosses the midline of the body. This often occurs in parallel with the pelvic dipping down on the trailing leg lengthening through the side of the body and leg. Step width may be targeted using the resistance band side walk shown above, and using cueing techniques such as running with the feet slightly further apart. Greater strain in the ITB has been shown in narrower step widths (Meardon et al 2012) so altering step width would seem a logical method of modifying symptoms in those with this condition. Even when this modification is not maintained, it may be one factor which allows subjects to self-manage the condition. Hip adduction and pelvic drop has been shown to reduce with gait retraining (Noehren et al 2011). External cues in the laboratory can include electro goniometry and video feedback, while for the average user mirror feedback on the gym treadmill may prove useful. Cadence may be changed using a simple metronome app on a smartphone. High cadence (greater number of steps) means that each step is shorter, reducing ground contact time and total load on the weight bearing leg. Subjects have been shown to increase step rate (7.5%), and to reduce vertical load rate (17.9%) and peak hip adduction (2.9°), following an eight session training program using a simple wireless accelerometer of the type found in a smartphone or sports watch (Willy et al 2016), so the results of laboratory investigations have made their way directly into the field to help subjects performing recreational sport. Improving healthcare through social media: ready, steady, go!